Social media marketing is one of the best ways for your industrial company to ensure that you reach your target audience online. When you market your industrial company on social media, you'll be able to entice them with photos, send them to your website with links, and advertise special offers. This free guide will help your industrial company implement social media marketing into your strategy. Social media can help your industrial company increase traffic to your website, advertise effectively, and even boost revenue. But not all platforms are created equal. This free guide will give you an idea of what platforms are beneficial to your industrial company, what to post on them, and why they work. Every day, billions of Internet users turn to social media platforms for news, information, and to keep in contact with friends and family. Imagine advertising your industrial company to thousands upon thousands of people - from the comfort of your social media profile. 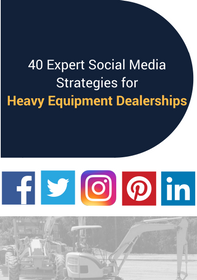 If you're not sure how to handle your industrial company's social media presence, this guide till cover 40 different strategies to help you out. That's what we're here for! We know that you're busy running your industrial company, so we can take full responsibility for your social media strategy.